MoonMarble.com - Jerilyn Alderman (Firechilde Glass) - "Cobalt Dichroic Spiral"
Art Glass → Contemporary Handmade Marbles → Jerilyn Alderman (Firechilde Glass) - "Cobalt Dichroic Spiral"
This is a handmade marble by Jerilyn Alderman of Firechilde Glass. This is a clear marble containing a spiral of transparent sparkly dichroic glass over a background of deep blue sparkly glass. 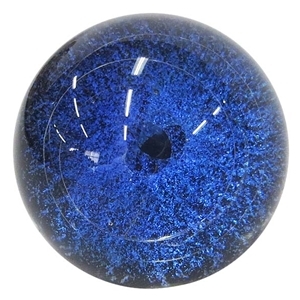 When you look at the marble from the side you can see the hint of a clear spiral contained in a clear marble, but from the top it looks like it is filled with sparkly blue glass. Approximately 1 1/2" in diameter. Signed and dated.